“If you hear anything about Louisville, give ’em the hand. I don’t want to hear anything.” That was Memphis coach Josh Pastner last Wednesday night, after his team’s 26-point beat down of the Ohio Bobcats at FedExForum. Pastner extended his right arm as he warned the media contingent about looking beyond the Tigers’ next opponent . . . Austin Peay. With the Governors now safely out of the way (on the wrong end of an 83-65 score last Saturday afternoon), anyone remotely connected to the Memphis Tiger program can scream Louisville insults to their heart’s desire. For this Saturday’s tilt at FedExForum is what the smart analysts call a BIG GAME. 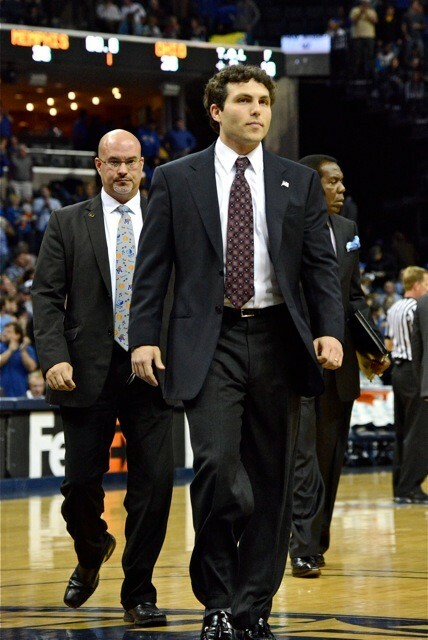 Fact is, the Tigers’ win over Ohio last week may be the biggest of Josh Pastner’s four-year coaching career. It may not have been a top-20 opponent, and may not have been a postseason affair, but it was certainly the program’s most needed win since Pastner took over before the 2009-10 season. The Bobcats came to town with credentials: a 6-1 record, a Sweet 16 appearance in last March’s NCAA tournament, and top-dog status in the MAC. Had the Tigers lost to Ohio, ironically, it would have been more acceptable than the lifeless defeats Memphis took (to VCU and Minnesota) in the Bahamas last month. More acceptable on paper. But a loss to the Bobcats would have reduced an already anxious fan base to that state of twitching in dark rooms, talking to oneself about what could have been . . . and what should be if this were changed, or that player were gone, or that coach were gone. A blowout win over that Ohio team? All’s well, at least until Louisville comes to town. Seasons have tipping points. Last year, three days before Christmas, the Tigers lost at Georgetown, dropping their record to 6-5. A players-only meeting ensued, which may or may not have been the spark for a 20-3 run and a thorough sweep of three games to win the Conference USA tournament at FedExForum. Spark or not, that meeting was the season’s tipping point. This season, the Tigers have played to a form growing too familiar to their legion of followers: beat up on lesser competition, but struggle when the big boys flex. VCU and Minnesota are sound programs, but neither can suit up three McDonald’s All-Americans. If the Tigers can’t impose their talents on the Rams or Gophers, what will happen if the road leads to Tar Heels, Hoosiers . . . or Cardinals? The seven years that have passed between visits from Louisville is the longest drought since the teams first played on January 6, 1949. And with the Cardinals’ pending move to the ACC — just as the Tiger program seemed to have chased them down in the Big East — games like Saturday’s are not a given, not “just another” important game as Pastner’s players are taught. A win over a top-five team that just happens to be the Memphis program’s Green Goblin (or Joker, Batman fans) would be this season’s tipping point. Saturday's matchup in Tulsa is Conference USA's version of Alabama-Florida. This will be the third meeting between the Knights and Golden Hurricane since C-USA first held a football championship in 2005 (a Tulsa win over UCF). Tulsa is 1-2 in the championship game (losing to UCF in 2007 and East Carolina in 2008) while the Knights are 2-1 (in addition to the 2007 title, UCF beat SMU in 2010). Tulsa is coming off a loss to SMU, while UCF has won seven of eight (the only loss being at Tulsa). I like home games in December. The Memphis Tigers and Louisville Cardinals have played each other on the basketball court 85 times. 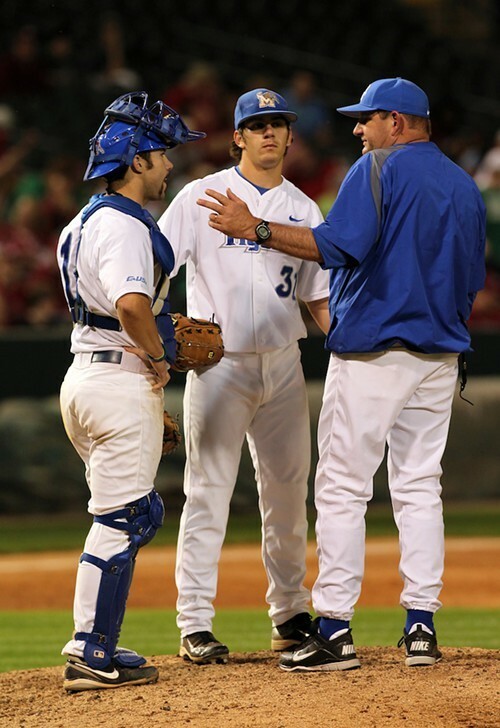 (The only other program Memphis has faced as many as 70 times is Southern Miss, with 86 games in the books.) These teams played each other every season from 1967-68 to 1990-91, then 11 more — as Conference USA members — from 1994-95 to 2004-05. Which makes it a sin that six full seasons have passed without a Tiger-Cardinal blood match. That ends this Saturday when the Tigers take the floor at Louisville as part of the Basketball Hall of Fame Shootout. If you have holiday shopping to do, get in your car at 3:00 Saturday afternoon. Traffic will be light. Ronnie Robinson in full flight. These are teams that played each other three times in a season 13 times, which means few Metro Conference tournaments were held without the marquee matchup of Memphis-Louisville. The Tigers beat the Cardinals for the Metro tourney title in 1982 and ’87, and Louisville beat Memphis for the title in 1986 and ’88. Dana Kirk vs. Denny Crum. 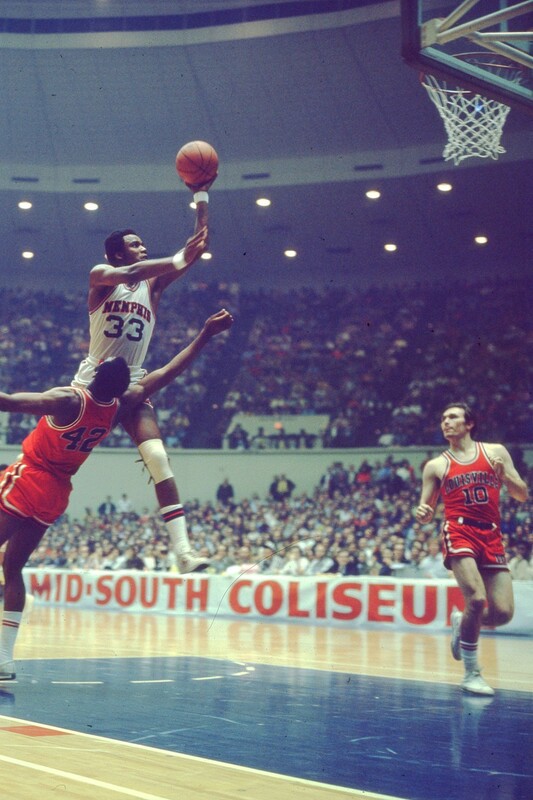 Elliot Perry vs. Pervis Ellison. John Calipari vs. Rick Pitino. And how about Anthony Rice vs. Francisco Garcia? The 2005 C-USA tournament championship at FedExForum remains the best college basketball game I’ve seen live at an arena. During one 60-second stretch late in the first half, the teams traded the lead on four consecutive possessions, each field goal a three-pointer. Riveting. That game will forever be remembered, of course, for the three free throws Darius Washington had after time had expired with the Tigers down two points. Had Washington made all three, the Tigers would have earned an unlikely — undeserved, really — NCAA tournament berth. He made the first, winked at coach John Calipari, and then missed the next two. Washington had to be helped from the floor by Calipari and teammates after collapsing in defeat. More tears would surely have fallen that afternoon six years ago if Tiger fans knew it would be this long before the only rivalry that really matters to the Memphis program was resumed. Memphis has played SMU ten times since last facing Louisville. UCF and UTEP have been annual foes since the 2005-06 season. The Tigers faced Gonzaga, for Pete’s sake, six straight seasons . . . without Louisville on the schedule. This is a town that loves its ’rasslin’ and relishes a good “bad guy.” Replacing Louisville on the Tiger schedule with Gonzaga is like removing the Mongolian Stomper from a wrestling card in favor of Cyndi Lauper. Sports are at their best when longtime rivals clash. Ali-Frazier. Nicklaus-Player. Bird-Magic. There’s a reason you can’t avoid Yankees-Red Sox during the summer if you own a television. These are the games that cause divorces, end friendships, stir the foulest language from the depths of a fan’s cheering soul. They’re games in which money, rankings, and star power don’t matter. Only the final score and bragging rights. We’re in the final days of a six-year drought; the longest Tiger (or Cardinal) fans should have to suffer. So get your sleep, take your vitamins, and hide anything red in your living room (including, yes, all images of Santa Claus). Memphis and Louisville are playing this Saturday. Nothing else matters. • The Tigers are looking to extend their winning streak to four games, their longest since starting the season 7-0. Memphis has won its only two home games in Conference USA play (over East Carolina and Marshall). • After starting the season 14-0, UCF has plummeted to the bottom of the C-USA standings, where they are 1-4. After beating Marshall on January 5th, the Knights have lost four straight (Houston, Southern Miss, East Carolina, Rice). Nonetheless, in their first year under coach Donnie Jones, the Knights are on the verge of matching their 2009-10 win total (15). • A pair of sophomores are the top scoring threats for UCF. Marcus Jordan (Mike’s kid) is averaging 15.8 points per game and Keith Clanton is averaging 15.6. They are 10th and 11th, respectively, on the C-USA scoring chart. Clanton ranks fifth in the league in rebounding with 8.7 per game and third in field-goal percentage at 52.9. • As a team, UCF ranks fifth in C-USA in scoring with 73.3 points per game. (The Tigers lead the league with 78.1.) But UCF has had the stingiest defense in the conference, giving up only 60.4 points per game. (The Tigers are last in this category, giving up 71.0 points per game.) UCF also paces C-USA in scoring margin at plus-12.8 (the Tigers are plus-7.1). • UCF had two big intra-state victories before C-USA play started. The Knights beat Florida on December 1st, then knocked off Miami on December 18th. • The Tigers enter Wednesday’s game tied atop C-USA with UTEP, each team 4-1 in league play. At 15-4, Memphis is one game ahead of its pace a year ago. • The Tigers have won all eight contests they’ve played against UCF, including a 76-70 win last February. These teams started playing annually when UCF joined C-USA for the 2005-06 season. They had played three times previously, all in the Seventies. • It’s been a while since Memphis has not had a player near the top of the C-USA scoring chart. But Will Barton is currently pacing the Tigers (12.6 ppg) and ranks 20th in the league. More disturbing may be the fact the Tigers don’t have anyone in the league’s top 20 in rebounding. No Tiger is pulling down as many as five boards a game. Freshman point guard Joe Jackson is fifth in the league in assists with 4.2 per game. • Wednesday’s game is part of a stretch that has the Tigers playing five of seven games on the road. Their only home games between January 9th and February 11th are the UCF game and February 2nd, when they host Tulsa. • The Volunteers enter the game with a record of 9-4. After a 7-0 start, UT has lost four of its last six games, including a pair of ugly defeats at the hands of Oakland and the College of Charleston. The Vols took down a pair of Top-10 teams from the Big East: Villanova on November 26th and Pittsburgh on December 11th. Tennessee will open its SEC schedule this Saturday at Arkansas. • Junior swingman Scotty Hopson paces the Vols in scoring with 16.4 points per game. He had a season-high 27 against Pitt and 24 in the loss to Charleston. Freshman forward Tobias Harris (6’8”, 226 lbs.) averages 15.0 points and 6.6 rebounds. Senior Cameron Tatum is a third threat (10.5 points, 3.5 rebounds, 2.2 assists). • Junior Wesley Witherspoon is looking for a “bounce-back” game, having accumulated more fouls (4) than points (3) against Tennessee State last Sunday. After missing two games following knee surgery, Witherspoon hit only one of five shots against Georgetown, but then erupted for 28 points and 14 rebounds against Lipscomb on December 30th. • The Tigers have enjoyed balanced scoring, when measured across their last five games. (The goal, of course, being to get such balance within a single game.) Memphis has had a different leading scorer in each of its last five games: Chris Crawford (18 against Austin Peay), Joe Jackson (23, Texas A&M-Corpus Christi), Will Barton (18, Georgetown), Witherspoon (28, Lipscomb), and Antonio Barton (24, Tennessee State). And Tarik Black had a season-high 22 Sunday against TSU. • Tennessee owns a 13-8 edge in the series, with the teams now meeting for a sixth straight season. The Tigers have lost three of the last four contests, including the epic showdown between the country’s top two teams on February 23, 2008. (In that game at FedExForum, #2 Tennessee beat #1 Memphis, 66-62, ending a 26-game winning streak for the Tigers.) In last season’s game at FEF, UT won 66-59. Witherspoon had 11 points and 7 rebounds in that New Year’s Eve battle. The Tigers are 3-7 in Knoxville. • In the win over Tennessee State last weekend, the Tigers had 25 assists and only 11 turnovers. This marked the first time in eight games that Memphis had as many as four more assists than turnovers. In eight games this season, the Tigers have had more turnovers than assists. For the season, point guard Joe Jackson has 56 assists and 47 turnovers. • Tennessee enters the game with an RPI ranking of 40, while the Tigers are ranked 67th (just behind UAB and Ole Miss). UCF (12-0) is currently the highest-ranked C-USA team at 16. • Wednesday’s game will be the Tigers’ last before C-USA play starts this Saturday (East Carolina, FEF). Last year, Memphis entered league play with a record of 10-4.